Iran v Nigeria - what can we expect? Just when Ghana thought they had done enough to earn a point, substitute John Brooks scores with an unmarked header from a corner. Ghana finally make the breakthrough their second-half possession deserves. Asamoah Gyan lays the ball off for Andrew Ayew to shoot past Tim Howard. Kevin-Prince Boateng and Michael Essien are on for Ghana as they look to capitalise on their greater possession. So far they have lacked a cutting edge to break down the Americans. The US defence is creaking but it has not been breached yet. The USA have made a change in defence, bringing on John Brooks for Matt Besler, who looked like he hurt his hamstring late in the first half. The USA stunned Ghana after taking the lead after just 32 seconds through Clint Dempsey. But Ghana kept their composure, showed some quick feet in midfield and tested Tim Howard in the USA goal. USA forward Jozy Altidore went off with a hamstring injury but Aron Johannsson looks a tidy replacement. Jozy Altidore has been carried off with what looks like a serious hamstring injury. Aron Johannson replaces him. A goal in the first minute – timed at 32 seconds! – and normal service is resumed at this World Cup following the goalless draw between Iran and Nigeria. Dempsey drove at the Ghana defence, cut in from the left and fired past Kwarasey. Quite a start. Here are the line-ups for the third and final game of the day. Essien and Prince-Boateng surprisingly on the bench for Ghana. USA unchanged from the team that beat Nigeria in a pre-tournament friendly. At the 13th time of asking we have our first draw of Brazil 2014. There can be decent 0-0 draws, but this wasn’t one of them. Iran will be pleased to have taken a point, while Nigeria, who were marginally the more dangerous side, will rue their inability to translate their abundant possession into anything tangible. 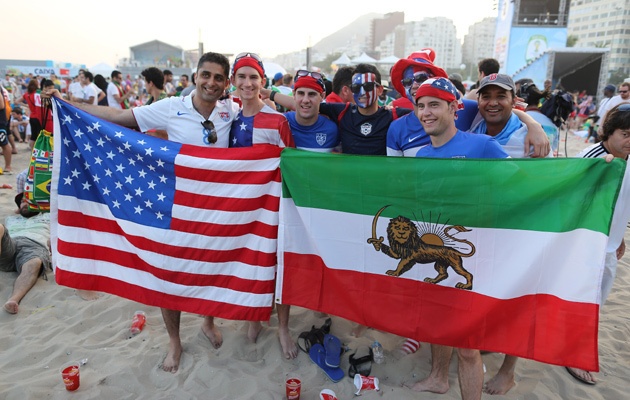 Iranian and American fans pose for a photo inside the FIFA Fan Fest area on Copacabana beach, in Rio. World Soccer’s James Montague’s succinct appraisal of Nigeria. I thought Nigeria would be better than this. Awful. Iran have barely left their own half but they somehow force a corner. Ashkan Dejagah crosses to the edge of the six-yard box where Reza Ghoochannejhad has escaped his marker, but his firm header is well saved by Nigeria keeper Vincent Enyeama. That’s the closest we have come to a goal so far and it came completely against the run of play. Moving on to today’s second game and we’re in Curitiba for Iran vs Nigeria. Granted, it’s not a fixture that leapt off the page when the draw was first made, but Brazil 2014 has been nothing if not surprising so let’s hope both sides can maintain the entertainment quota. Cue the first drab, goalless draw. Anyway, the starting line-ups are in and neither coach has sprung any surprises with their selections. Just to remind you that the other two teams in Group F are Argentina and Bosnia-Herzegovina. Pretty comfortable win for Germany. Who knows how Portugal would have coped with a full complement, but on the evidence of the first 37 minutes, they were always going to struggle. Cristiano Ronaldo got 90 much needed minutes under his belt, which be serve him well in the coming games, but the story today was all about Thomas Muller who has now scored 8 goals in 7 World Cup matches. In fact, Muller scored more goals today than Ronaldo has managed in three World Cup finals. A cross comes in from Andre Schurrle but Rui Patricio is unable to hold it and the ball falls to Muller who can’t miss from five yards out. First hat-trick of the tournament to Muller, who was the Golden Boot winner four years ago in South Africa. Fabio Coentrao looks in a lot of pain here. The Portugal defender is clutching his right hamstring after stretching to reach an overhit crossfield ball. He’s carried off on a stretcher and if it is his hamstring then that could be the end of his World Cup campaign. Muller gets in front of Bruno Alves before drilling a low shot which Rui Patricio can only help into the net. Portuguese defender becomes involved in a needless spat with Thomas Muller and foolishly presses his forehead against the German’s head. Straight red for the Real Madrid man. Too easy for Germany. A corner is swung over and Mats Hummels rises unmarked to head in from six yards. Thomas Muller dispatches the spot kick into the right hand corner of the goal and Germany are off to a flier. .
Mario Gotze is through on goal but is hauled down ten by Joao Pereira and the referee points straight to the spot. The defender is perhaps fortunate to only receive a yellow card. Portugal goalkeeper Rui Patricio wanders out of his goal but is unbelievably lax with a clearance and it falls to Sami Kehdira, who fires it back at the empty goal, but his shot is off target. According to the FIFA rankings, two of the four best teams in the world will be on display today, when Germany face Portugal in Salvador. Much of the pre-match build-up has centred upon the fitness of Cristiano Ronaldo, and happily for those of us who wish to see the best players on display at the World Cup, the current World Football of the Year has recovered from knee and thigh injuries and will start. As for Germany, they have emulated Spain’s Euro 2012 formation and opted for a striker-less selection. 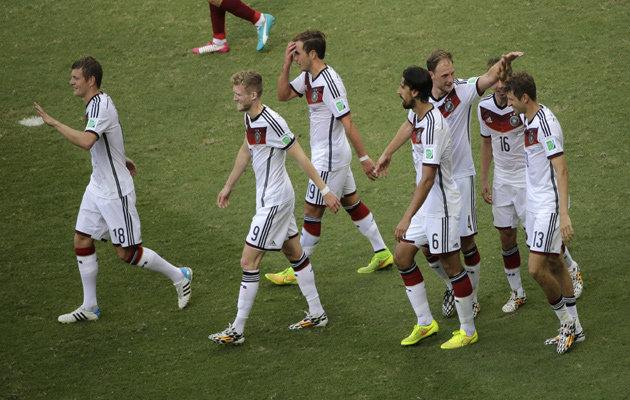 Germany: Neuer, Boateng, Hummels, Mertesacker, Howedes, Lahm (c), Khedira, Ozil, Muller, Kroos, Gotze. Portugal: Patricio, Alves, Pepe, Veloso, Coentrao, Ronaldo (c), Moutinho, Almeida, Meireles, Nani, Pereira. Alejandro Sabella knows that for his Argentina side to have any chance of winning the World Cup, he must get the best out of Lionel Messi. On the evidence last night’s game against Bosnia-Herzegovina, he remains unsure of how best to achieve this. World Soccer editor Gavin Hamilton writes about the tactical conundrum facing Sabella, and how he can utilise Messi’s talents without compromising the balance of the team. Looking ahead to tonight’s game between Iran and Nigeria. Here’s World Soccer’s tactical guide to the Group F clash. Live rounds fired at protestors? There were protests last night in Rio to coincide with Argentina’s game with Bosnia-Herzegovina at the Maracana. According to eyewitness reports, a policeman fired live ammunition at the demonstrators. It looks like Cristiano Ronaldo will be fit to face Germany when Portugal begin their World Cup game in Salvador this afternoon. Here’s our tactical guide to this fixture, one of the most eagerly awaited group matches at Brazil 2014. As Argentina kick off their World Cup campaign, we bring you more captivating images from Brazil 2014. Too much time on your hands? You’ve come to the right place. Take a look at England vs Italy as told by Lego. No one saw this one coming. Unfortunately, for England, the only stat that really mattered was the 2-1 scoreline in Italy’s favour. It was a game of two halves for Argentina and Lionel Messi in their opening game against Bosnia-Herzegovinia. World Soccer editor Gavin Hamilton was present in the Maracana for that game, and he will be writing later about the half-time tactical switch which brought the best out of Messi. Here are his initial thoughts on that game. The forward himself, who scored a stunning second half goal, admits that there is still plenty of room for improvement for Alejandro Sabella’s side. “It’s important that we started off on the right foot with the three points, but we do have things we must improve,” he said afterwards. With all the talk about the effects of heat in Manaus, it’s easy to forget that for much of Brazil the World Cup is being played in several different climate zones. Natal, venue for today’s game between the United States and Ghana, and scene of the torrential downpour during Mexico’s 1-0 win over Cameroon on Friday, received so much rain that a state of emergency was declared. As you can see from this video report, those attending the match, should come prepared to brave the elements. Welcome to our coverage of Day 5 of the World Cup. Today we have three matches to look forward to, including arguably the tie of the first round matches. Later on Iran face Nigeria and Ghana meet the United States, but the most eagerly awaited fixture of the day is the early kick-off between Germany and Cristiano Ronaldo’s Portugal. Coming up, we’ll have previews of those games as well as all the other news from Brazil.